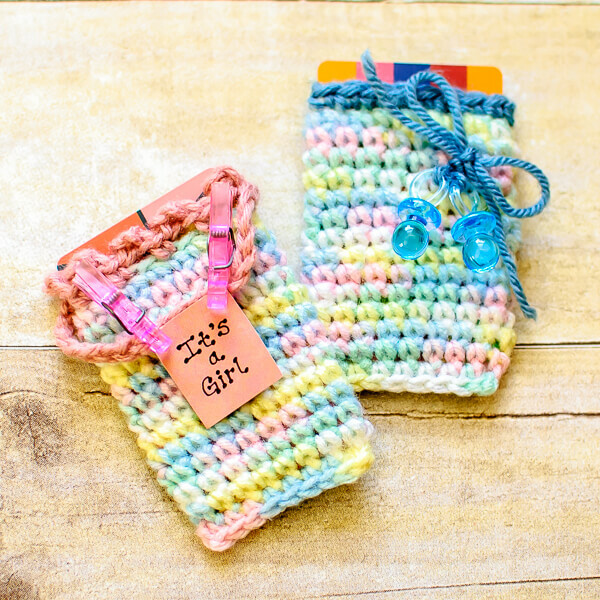 Crochet gift card holders are a great way to add a handmade or more personal touch when giving a gift card. I love that the recipient can get exactly what they want and need and still now I put time and thought into making the gift feel special and personal. 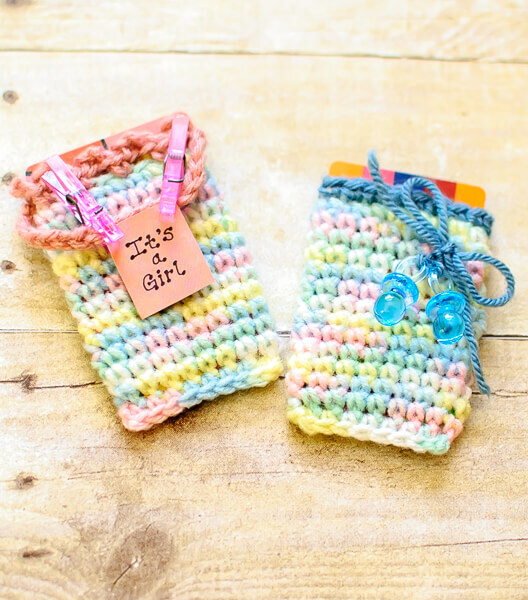 The crochet gift card holders I made here are personalized for a baby shower, but with a quick change of yarn color and finishing touches the gift card holders could be embellished to work for any occasion. Ch 16, Sl st in furthest ch from hook to form a ring, do not turn. Rounds 2 through 13: Ch 1, work 1 sc in same st as join and each st around, join — 16 sts. With a coordinating color yarn, edge the holder as desired. Here are the two edging options I used. Scalloped Border: Ch 1, beginning in same st as join, *work 1 sc, ch 3, skip next st, rep from * around ending with a slip st in first sc of round. Single Crochet Border: Ch 1, work 1 sc in same st as join and each st around, join. To close bottom of holder, turn piece around so that Row 1 is now on top, flatten cylinder; working through the unused loops of the beginning chain, pull up yarn in first loops, ch 1, work 1 sc in same loops and each pair of loops across. Fasten off and weave in ends. Now all the is left is to add a little embellishing if desired. Add a pretty bow or ribbon, attach a piece of candy, or any way use wish to personalize your gift card holder. I found these cute little baby decorations on clearance at the craft store. Kara, this is adorable and a much more personal way to give a gift card! Wow, what a cute idea. I love giving gift cards but this would make them so much more personal! this is a beautiful idea… thanks for sharing!